This is a story of gifts. It all started some years ago, when my parents gifted me with a compact disc album, Vive la Normandie, by Émilio Corfa. I was very much taken with the beauty of the song, Ma Normandie. My mother was from Normandy, and I was born there. I loved visiting my Normandy, and had made a few stabs at making a song that would convey my love for this land, but with little success. The project was still on the back burner. When I heard Corfa's rendition of Ma Normandie, my quest was over. I knew that any attempt on my part to make another song like this masterpiece by Frédéric Bérat would pale by comparison. My new quest would be to make this song my own. A few years later, my parents gifted me with an Appalachian dulcimer that they had picked up at a flea market. It was a sweet-sounding instrument with reasonably accurate intonation. Though I had never played the ducimer before, I was familiar with it from my college days, hanging around with my fellow 'folkies' and swapping songs between classes. Later, the popular Rhode Island folk duo, Atwater-Donnelly cemented my love and respect for the instrument. In short order I taught myself some playing techniques, and before long was working on an arrangement for Ma Normandie. When I thought I felt comfortable enough, I set out to unveil it in public. I decided to debut the song at an open-mic in nearby Londonderry, New Hampshire. I invited my parents without telling them anything about my repertoire for the evening. I wanted to surprise them with a gift of the song they had given me on the instrument they had given me. I can't explain why -- perhaps, because it meant a lot to me -- but I found myself suffering from a terrible case of nerves that night. 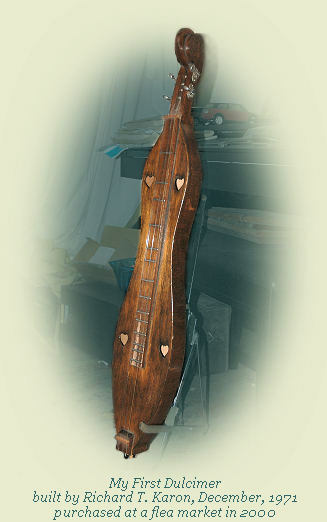 When it came my turn to play, I sat on the stage with my dulcimer in my lap, looked down at my dulcimer, and felt like I had never seen this instrument before. I was staring at a foreign fingerboard of fleeting frets. I managed to find a note here and there, and avoided striking any wrong notes, but I sang the song mostly a capella. The audience was polite, and my parents were appreciative, but I felt that my gift was inadequate. A couple of months later, my wife and I attended the Rhode Island Old-Time Music Festival in Pawtucket, two days of banjo, dulcimer, and old-time music workshops, hosted by Aubrey Atwater, and featuring the great Jean Ritchie. On the evening of the first day, we had a round-robin, and I chose Ma Normandie. When my turn came around, I stepped up to the 'hot' seat right in front of Aubrey. Jean Ritchie was not in attendance, but I was still, once again, feeling overcome by nerves. With Aubrey over my left shoulder, I introduced the song, dedicated it to my mother, explained my nerves, and proceeded to play. This time it was magic. My trembling fingers did their job; my voice rang out pure and clear, if somewhat quavery, and the audience fell silent. When I came to the instrumental break, I heard the audience quietly humming along, and on the crescendo of the final verse, the audience came forth, humming and harmonising. As the last note faded, I heard Aubrey whisper, "Wow!" Many congratulations, comments, and questions about the song followed. My wife pointed out that one young woman in the corner of the room had been brought to tears. This young woman, Bernadette came up to me and asked if I had a recording of the song, or if I would make a recording for her. We were invited to a get-together at Aubrey and Elwood's the next day. There Bernadette trotted out an old cassette recorder, and had me sing and record the song for her. Then Jean Ritchie came into the room, and Bernadette had me play the song for her -- A command performance for Jean Ritchie! -- Jean commented what a sweet song it was, and complimented me on my performance. My gift was worthy. The following Spring, I visited my Normandy for the first time in thirty years, and found her beauty undiminished. It would be my mother's last visit in this life. She passed away in August of that year. We would return to Normandy the following year to spread her ashes in her beloved waters in the bay of the Mont-Saint-Michel. At her funeral I sang and played Ma Normandie for her. The gift was complete.